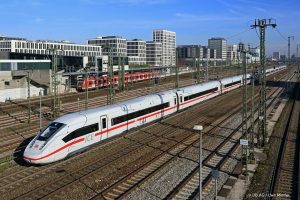 Richard Lutz, the CEO of Deutsche Bahn, unveiled the five-point plan for 2019 that envisages “concrete improvements”, with an increased investment and capacity, additional services and new plans to hire more staff. Starting the 1994 railway reform, the utilization of Germany’s railway network has increased dramatically and the intensity of the usage per track-kilometer has increased by 50 percent. At the same time, DB recorded passenger increase every year. “We reach our limits and the growth leads to bottlenecks. We need more capacity to handle the traffic of today and tomorrow. That’s why we want to extend our network, to launch more trains and to engage more employees. The goal is to improve step by step for our customers,” Lutz said. One of DB’s five-point plan envisages the implementation of new measures to improve long-distance services’ punctuality by 1.6%, reaching a 76.5% punctuality this year. The company intends to reduce the delays that cause bottlenecks in train availability. The company is systematically expanding the long-haul fleet and additionally strengthening the existing vehicles. To improve rolling stock reliability, DB will hire 200 technical staff at major ICE depots – in Hamburg and Cologne and in Krefeld, DB will increase workshop capacity by mid-2019. The measure also envisages a 5% increase in ICE trains availability, with a final goal of deploying 225 ICE trains per day in 2019. DB is planning a better management of network maintenance at 800 construction sites that is also “crucial for more punctuality”. Under the plan, Lutz said that the company will invest in railway network “more than ever”. EUR 10.7 billion will be invested this year, a EUR 1.3 billion increase compared to 2018. EUR 1.1 billion will be spent on digitalization projects. In addition, DB will hire 22,000 new staff, especially more train drivers, dispatchers and maintenance staff that will help to improve the quality of infrastructure and rail services. The third measure will see more reliable information and better comfort by implementing digital information systems. In the coming month, DB will equip 80 stations with new generation of displays, monitors and panels, and in Stuttgart and Leipzig the lounges will be rebuilt. In addition, new and better services will be offered at 650 on-board restaurants and on-board bistros. Extending the offer is another 2019 plan. Since the new timetable (December 2018), the company introduced 4% more seat-km in long distance services. 15 new ICE4 and 10 new IC2 trains were put into operation in December, creating 20,000 additional seats. In December, DB also offered new services on the “booming Berlin-Munich” route with two additional ICE Sprinter trains per day. Regarding to Munich and Hamburg S-Bahn, the trains will be modernized to meet the growing number of passengers. The company intends to purchase new trains. The fifth measure envisages the development of rail freight transport, with a greener network, by increasing the share of renewable energy. By the end of 2019, DB will increase the traction generated by renewable energy by 3%, reaching 60% (from 57%). In order to make a contribution to the climate change in Germany, DB is determined to successfully push ahead with the upcoming redevelopment of our freight railway by hiring new personnel, purchasing new locomotives and wagons, and will introduce a sales offensive that will bring more goods to railways. “We want to grow with DB Cargo, defend our market share and win new customers,” Lutz concluded.